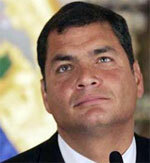 Correa: Buying political capital with debt restructuring. Ecuadorian president Rafael Correa has made good on his 2006 presidential campaign promise to default on any foreign debt deemed illegitimate, defaulting on $3.9 billion in global bonds. This marks Ecuador’s seventh default since gaining independence in 1830, with the most recent taking place just a decade ago. A Public Credit Audit Commission completed a year-long audit of debt contracted between 1976 and 2006 and determined that much of it was issued without proper government authorization and involved usurious interest rates. In a 172-page report, the commission called on Correa to halt payments on outstanding debt and bring to justice those involved in managing a 2000 global bond issue. That could include bankers at Salomon Smith Barney, now part of Citi, and at J.P. Morgan. Correa is reportedly putting together a restructure offer, with investors likely to get a haircut even larger than the 70% offered by Argentina in its $100 billion workout.